Just as they are anywhere else, Saratoga Springs NY golf etiquette, rules and dress code are important for the beginner to know. More than just game rules, the display of good manners and the understanding of protocol on the course ensure the safety of the players, a smooth flow to the game, and the quality of the greens and the golf course itself. Dress Code: There is usually at least a minimal dress code for golfing, the most typical requirement being that a collared shirt be worn. Long pants and golf shoes may also be required. Be sure to ask what the course expects prior to reserving your tee time the first time out. Safety: Be sure everyone in your party is well out of your way before swinging your club. Never hit the ball until you know the party ahead of you is out of the way and at a safe distance. If your ball does go awry and is headed toward another player, yell out, "Fore!" as a warning. Keep it Moving: Don't make others wait for you to take your shot: be ready to go when it's your turn. If you have equipment problems, cannot find your ball or are just moving very slowly for some reason, it's appropriate to let the group behind you play through. Don't talk during another's swing or create distractions. If you're using a cart, obey all the posted signs and cart rules. Never drive a cart on the greens. Divots: If you take a shot and dig up a chunk of grass, always return it and patch it back into the same spot. Some golf clubs provide buckets of grass seed for that purpose. Bunkers: Just as you do with the divots, remove any evidence that you were there. Use the course rakes provided to smooth and level the sand after play. Flagstick: The rules state that the ball cannot touch the flagstick while putting. Either take it to the edge of the green or have someone tend the hole for you. 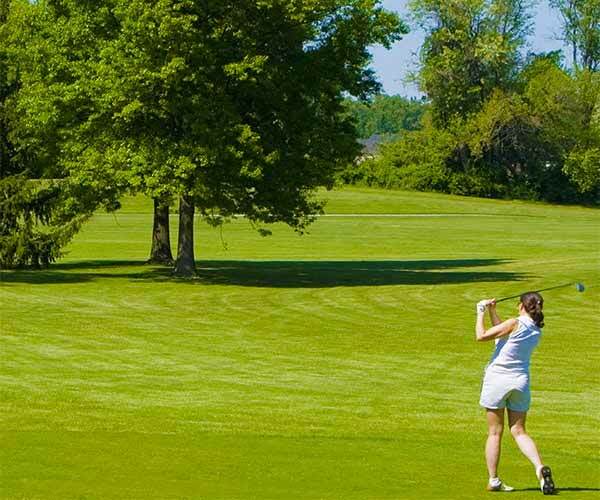 For the beginning golf enthusiast in Saratoga Springs New York, golf etiquette rules and dress code for golfing should be reviewed prior to playing the course. For a complete list of guidelines, visit the United States Golf Association (USGA) etiquette section. Most importantly, display good manners and sportsmanship behavior at all times, and enjoy a great round of golf in Saratoga!